TireCheck uses machine-to-machine (M2M) communications to accelerate international growth. 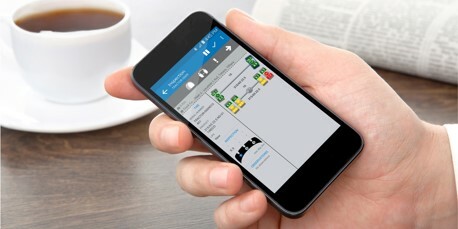 The TireCheck product is delivered as a preinstalled app on a ruggedised smartphone. This lets customers run reports about their truck or car fleets from anywhere. Seamless network connectivity is a critical part of making this work. In its early days, TireCheck worked mainly with customers that had a national reach, so it would source a local SIM with the best value for money in that particular country. As TireCheck expanded, it began working with larger customers who have international teams that need to travel across borders without losing connectivity or incurring roaming charges. TireCheck needed to ensure consistent 2G, 3G or 4G coverage for customers and their maintenance partners who expect reliable data connections for electronic report sending, no matter where they’re working. The IoT Control Centre allows us to have full sight of the infrastructure, from our servers to the network, to the customer’s handheld device. TireCheck chose Three to provide global SIMs that can be used in any country while being centrally managed from Ireland. Three’s solution enables the SIMs to roam between countries, automatically assigning the best cellular network for continued, unbroken connectivity. The SIMs are installed at headquarters in Clare and the phones are shipped directly to the customer, with no local customisation needed. Three recommended its IoT Control Centre as part of the solution, providing TireCheck with full visibility, monitoring and control of all SIMs in its field devices. The diagnostic capability this provides is a key benefit for TireCheck and delivers more value to its customers. “The diagnostics allow us to have full sight of the infrastructure, from our servers, to the network, down to the customer’s handheld device,” Michael O’Dwyer comments. The service also includes 24/7 support from Three’s Technical Support Desk in its award-winning Limerick Customer Care Centre. This is critical for an international company like TireCheck, which often needs to respond to customer queries in other time zones. Since partnering with Three in 2013, TireCheck has grown its number of connections tenfold. Three’s managed roaming has fed this accelerated growth, which is now at a point where TireCheck is active on almost every continent, including China, Thailand, Singapore and Russia. Having seamless connectivity and remote management has removed a significant barrier to entering markets, and has enabled TireCheck to provide another level of high quality service to customers. Larger tyre companies and their partners had consistently encountered challenges with organising and coordinating contracts with local telecoms providers to ensure devices would continue sending back data, no matter where they were being used. “We try to come across as a can-do company for our customers. They were looking for someone to take the connectivity problem away for them. It’s been easier for us to do the trials and because the customer has a seamless experience, it has meant that the trials have been very successful. The Three infrastructure obviously has contributed to that,” says Michael O’Dwyer. As TireCheck continues to enhance its product range to include vehicle-mounted systems, it expects sales volumes to increase dramatically, driving further growth for the Irish business. “We have got to get to the next generation, and we do want to continue to do business with Three into the future,” concludes Michael.